As @yuvipanda noted in T128158, this interface is rather confusing. What is a "service group?" I thought I just clicked a link that said "Create a new Tool." What are the constrains of this name and where will it be used? After a tool has been created, additional information can also be supplied. This information is a superset of the data needed for the toolinfo.json standard used by Hay's Directory. All tools documented using toolsadmin are automatically published to Hay's Directory. Some of this information can also be edited collaboratively by others. 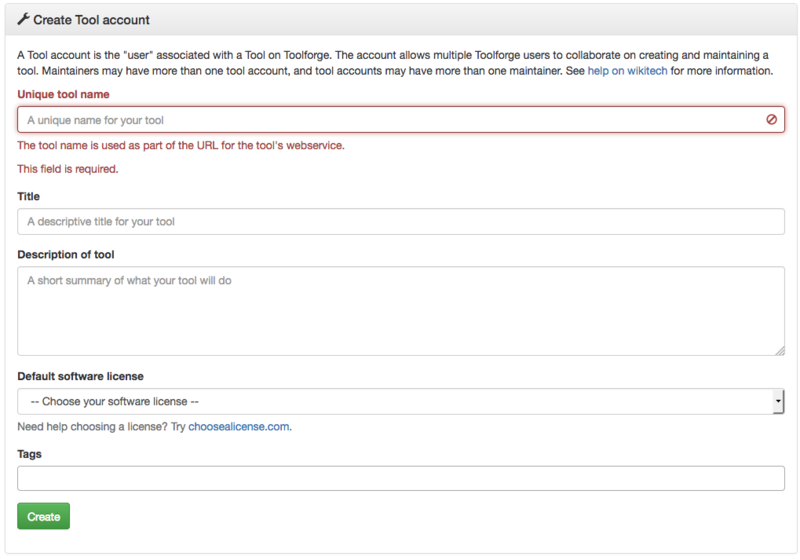 A tool can also have multiple toolinfo.json entries to support tools where a suite of functionality is published under a single tool account. The Striker project tracks bugs and feature ideas for toolsadmin. The application is written in Python3 using the Django framework. Like all Wikimedia software projects, Striker is FLOSS software and community contributions are welcome. See the project's page on wikitech for more information about contributing to the project. "Love" token, awarded by MarcoAurelio. "Love" token, awarded by TheDJ. "Love" token, awarded by Quiddity.